In a year when dance has finally taken off as the nation’s favourite art form, plans were launched today for BIG DANCE, the world’s biggest and most influential dance initiative to take place from 3-11 July 2010 and again in Summer 2012, just before London’s Olympic and Paralympic Games with hundreds of events already confirmed in London and an open invitation to cities and communities around the country to join in. Big Dance was established as a biennial festival in 2006 by the Mayor of London’s Office in partnership with Arts Council England and has grown to become the UK’s most important dance programme, with opportunities to experience, learn about and take part in dance for millions of people. More than a major dance festival, Big Dance is a vibrant campaign to get everyone taking part – wherever they are, whatever their age, experience or ability. Supported by leading figures from the dance world, it is delivered through a network of national and regional agencies. This year Big Dance was selected by Legacy Trust UK to receive a grant of £2.89 million as its keynote project for London, enabling a major expansion and a huge increase in its reach, with an anticipated 3 million Londoners taking part by 2012. The Mayor of London is also providing significant funding as part of his 2012 legacy commitment to increase participation, cultural opportunities across the capital and see Londoners get more active and healthy. T-Mobile UK, the company behind the iconic "Dance" advert, has come on board and is set to involve as much of London as possible in the Big Dance events, promoting participation from both T-Mobile and non-T-Mobile customers. T-Mobile Big Dance 2010 will include a daring takeover bid of London’s streets and public spaces with Big World Dance, a showstopping dance for 10,000 people, culminating in Trafalgar Square. Luca Silvestrini will direct five co-choreographers for the Big World Dance on Saturday 10 July 2010. Wayne McGregor, the Artistic Director of Wayne McGregor / Random Dance, recently described by The New York Times as " the closest thing to a rock star that ballet can currently claim", takes the commission in 2012. McGregor is the first Resident Choreographer of The Royal Ballet to have come from the world of contemporary dance. T-Mobile Big Dance 2010 features hundreds of other performances, workshops, free events, schools events, large-scale participation events and community programmes, organised through a network of London’s leading dance organisations, East London Dance, English National Ballet, Greenwich Dance Agency, Sadler’s Wells and Siobhan Davies Dance, acting as hubs to develop the vast programme of events featuring every kind of dance style in the capital. Richard Moat, Chief Executive Officer, T-Mobile UK: "From our experience with our Dance advert – which attracted over 17 million views on YouTube and spawned many fantastic imitation videos – we know how dance can really capture people’s imagination and spur them to get involved. We’re delighted to be supporting Big Dance 2010." 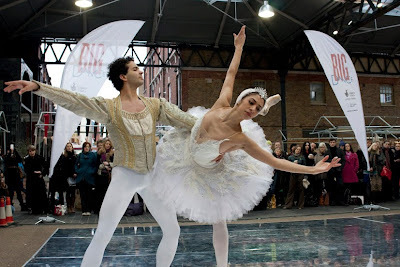 Big Dance is London’s Legacy Trust UK programme led by the Greater London Authority in partnership with Arts Council England and supported by major organisations including: Sport England, NHS London, London Councils, Museums, Libraries & Archives, London and the British Council. Wow that looks like an amazing show! I wish I could go and in London too? So beautiful! sounds wonderful - I hope to take part in some way will be great fun. Never know might take up ballet again! OceanDreams - I think you should ! They have lots of exciting things planned over the coming months. kanishk - it is !